The whole Sacred Heart School – Ateneo de Cebu community celebrated the first mass of the school year: the Mass of the Holy Spirit last June 24, 2016 at the Magis Eagles Arena (MEA). The celebration began with the welcoming of the first batch of Senior High School students. The Grade 11 students, together with their class moderators and co-moderators, paraded at the MEA as the SHS-AdC community, garbed in red, welcomed the Senior High School department with a warm applause. The new class sections (that are symbolic of the Ateneo Hearter’s values) were introduced: Magis, Eloquentia, Fides, Humilitas, Magnanimitas, Amare, Servire, Veritas and Sapientia. The entire Eucharistic celebration was solemn as the school community begged for the graces of the Spirit. During the mass, the whole school community also prayed for the eternal repose of the soul of Timothy Ian Francis Alvarez, a Grade 5-Garate pupil, who passed away last June 22, 2016. Mr. and Mrs. Alvarez expressed how grateful they were for the community’s support during this trying time in their family. Despite this sad event, the school was still moved by the Spirit to strengthen their passion of Excellence, Leadership, and Service as the Administrators, Faculty and Staff Representatives, Student Leaders, Alumni and PTA presidents were missioned. During the homily, Fr. John Emmanuel Guevarra, S.J. or Father Jem, who had been part of the Jesuit mission in China for fifteen years and is the newest member of the SHS-AdC Jesuit community, narrated how he was guided by the Holy Spirit in choosing his vocation. He recalled the event of the First Reading (Acts 2:1-31): the Holy Spirit descended upon the Apostles and blessed them with the gift of the tongue. He said that the Holy Spirit’s gift of tongue is like a sword that cuts through barriers of communication. The tongue that enables the Apostles to speak different languages is a gift that will help them proclaim the Word of God. Coincidentally, Fr. Jem, who used to be an international fencing champion, metaphorically offered his sword to the Lord as he promised to cut barriers of communication in China and proclaim the Good News to the Chinese. At the end of his homily, he stirred the audience with the questions: Why are we learning Chinese? Why are we learning what we are learning? He hoped that like him and St. Ignatius of Loyola, the students will be able to find a deeper meaning of why they are learning Chinese and the rest of the subjects in school. He also prayed that once the students will be able to receive the gift of the tongue, they will use it like a sword that cuts barriers of evil or selfishness so that people can see God’s goodness in them. The Red Mass ended with the celebration of Fr. Nuñez’s 94th birthday. Graced with the Spirit of joy, Fr. Nuñez sang his favorite song, Chaplin’s “This is my Song”, as pupils and students lined up to greet him and to give him his favorite chocolates. Indeed, the Holy Spirit Mass was a good way to start the school year for its energy fueled the Ateneo Hearters’ strength to combat the “dying of the light”, especially for those who mourned for Timothy’s death. 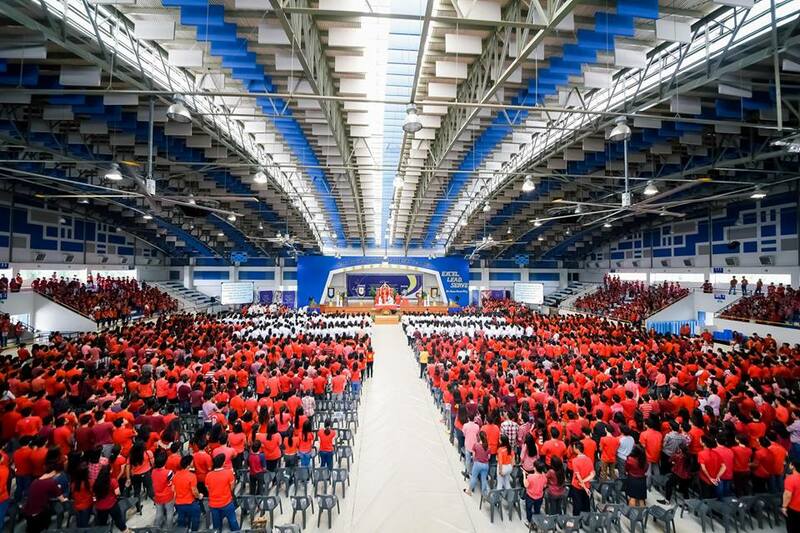 The Holy Spirit Mass was also a way of igniting a new burning flame in the Ateneo Hearter as the school community begged the Holy Spirit to gift them with light, guidance, and inspiration to become men and women for others, for the greater glory of God.